"Easy to use but still in the early stages on the product"
This tool is good for a user who is not familiar with database design or structure. It is easy for a user to create a report on their own by simply typing something like "sales for division 1 last quarter"
This is still early for this fresh new product so the charts are not as modifiable as some other BI tools. Also the charts on a dashboard DO NOT link so if you highlight/select something on chart 1 it does not highlight/filter chart 2. This feature needs to be added to be a serious contender. We have various KPI dashboards created in thoughspot that are primarily used by directors and above. It is easy for them to get in and view the dashboard and switch between the dashboards. ThoughtSpot fits the sweet spot of total cost of ownership and ease of adoption. Once information is configured and curated, there is no required IT touch. Adoption is user-driven rather than IT pushed. The costing model is based on amount of data stored in ThoughtSpot. Even with AWS storage costs and as user adoption grows, there is no better cost per user BI application on the market. Understanding the value proposition that ThoughtSpot offers, it is not focused on high-density, crisp visualization as other applications provide. There is a 5-10% use case that cannot be solved by ThoughtSpot. I am interested to see if this 5-10% use case fades away over the next few years. Start with one instance and let business team members evangelize and lead adoption. Keep IT out of the way. My company needs to learn how to have a conversation with information, rather than to simply digest content delivered via static slide decks. ThoughtSpot is critical in changing the way we consume insight. As insight delivery moves from pull to push and the iteration questions can be answered more quickly, we will reach a spot where we are leading information rather than simply trying to keep up with it. "Excellent BI Tool for Analytics!" I love how ThoughtSpot has the ability to set automatic system updates at set intervals to ensure I always have access to the most recent data unlike other BI tools I have used in the past. ThoughtSpots user interface is simple and straightforward. Even at first glance the system is clean and organized and only requires a brief tutorial on how to create reports, generate data visualizations, and customize user pin-boards. Pinboards, in lay-mans terms, are essentially the equivalent of web browser bookmarks, but for your frequently ran reports. Another great feature of pin-boards is that I can share them with my colleagues as needed so I don't have to run or create and pull reports for them. I must admit that the pinnacle of their software is the analytical abilities it offer, there are so many different ways to present data. I love the default reports they included with our system after integration into our internal homegrown tracking software; they understood what we needed and how we need to see it with very little explanation during implementation. I think it goes without saying that they took the time to ensure their reports would export into other programs such as Excel for additional manipulation and analyzation, which makes life so easy for our leadership team when generating and reporting on productivity to upper management. There is an initial learning curve can be somewhat overwhelming, but with the proper training (provided by their customer service team), it quickly becomes clear just how easy it is to utilize their software. I will say that there is no way we our system would run as smooth as it does without our IT Department. I would imagine most companies looking into TS for BI would have a strong IT Team able to manage the necessary routing and pulling of data from your data source; I cannot imagine a company utilizing ThoughtSpot without the proper staff in place to work with their team during implementation and integration due to the sheer complexity of mapping the system. 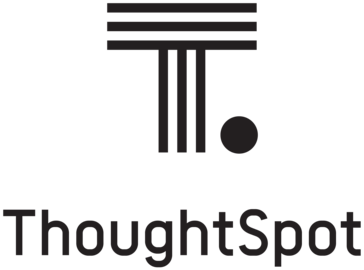 If you or your company are looking for a third party BI software to integrate with an internal system that houses data and need better management and access to quality reporting then I highly recommend looking into working with ThoughtSpot. Their customer service is absolutely excellent and I am confident they will have the ability to answer any questions you have about integration and the viability of use. Our company uses ThoughtSpot as our primary analytical tool that is connected to our homegrown system we built to connect the high volume of various systems we work in due to the large number of clients we in their own practice management systems. While our internal BI tool is excellent for data mining and organizing the data entered daily by our production staff, ThoughtSpot is what makes the next level analytics possible. "Company Data Analytics at Your Fingertips"
My favorite part of ThoughtSpot is that it updates at set intervals to ensure we always have the most recent data (our companies threshold is every 4 hours) available and ready to analyze at the drop of a dime. I love that I can work with our IT Department as needed to make updates and change specific categories based on how I need to analyze and present the data, but my absolute favorite part is the intuitive and straightforward dashboard that ThoughtSpot has put together. At first it seemed a little overwhelming, but once I received a brief training on how to create, modify, and run reports it became clear just how powerful this software is. I appreciate that I can create my own pin-boards that contain my custom made reports that I run on a scheduled basis and it also allows me to share any of my previously made reports, or entire pin-board for that matter. With the click of a button I can provide access to my peers so they can review and utilize my report as needed. I can't say it enough, but their reporting system is absolutely amazing; if you can think of a way to organize your data, then you can do it. I appreciate the default data visualizations they provide you in your home dashboard after initially logging in and the best part is they are fully customizable. My favorite aspect however is how easy it is to export reports into CSV/Excel files so that you can take the reports a step further and complete additional analysis and manipulation as needed. I love ThoughtSpot Analytics, but I will admit that the initial learning curve can be somewhat overwhelming until you take the time to sit down and learn how to properly use it, but the interface is extremely user-friendly so it is important to take your time. The only downfall that I dislike is that you need a strong IT Department that understands how to code to properly setup and assign data points (especially if they are being mined from another program) to ensure they properly routed/identified in the reporting dashboard so you can manipulate the data accurately. Our company uses ThoughtSpot as it's main analytical tool that is connected to another internal system we use to mine and track data from the productivity of our employees. It has allowed us to essentially connect more than 250 clients across the country that use different RCM systems and compile all the data into one area allowing us to create ad-hoc reports. It has helped us increase not only our productivity in all departments, but it allows us to filter and report on all this centralized data we generate on a daily basis. It has completed revolutionized how we analyze and report on our clients. The ability for end users to upload data (with appropriate rights) to do instantaneous visualization. The automation method for creating daily data loads is overly complicated and the ODBC has really never delivered as needed. We have solved ad hoc reporting for our external customers relative to very specific data views. The single greatest benefit we have realized is cost savings by putting report creation in the hands of our service associates versus needing a technical team. "Fast and flexible Insight Tool"
Very easy to adopt - no long learning curve to start to get meaningful insights into previously hard-to-tap data. US date formats! Doesn't (currently) default to sorting by things like dates in tables. Occasionally switches graph format when you weren't expecting. Great for giving business users access to high volume data which updates regularly, particularly where you ask a lot of adhoc questions of the data. Won't solve any underlying data quality issues though - in fact will force you to confront them! Reducing basic MI work load for analytical team; serving data direct insights to business decision makers. Insight being gained faster, less time wasted. "Well thought out product, fits our needs"
From my experience you need to evaluate this for yourself and you'll be surprised how easy it is to deploy and use. Many different areas with their own needs, but all want answers fast. ThoughtSpot gives us an edge in a fast moving business. I do like the ability to ask questions about the data - can be very user friendly. Tool has a lot of potential, but still immature. Documentation/Guides content vague/ambiguous. Inconsistency with bugs/errors. Basic UI/UX for visualizations lacking (for example dual axis only has 1 available y range to set, which doesn't make sense for plotting $ & %, furthermore the visualization will render okay for answer, but errors on pinboards). Also ability to pin objects to pinboards is confusing with enabling filters and leveraging worksheets vs aggregated worksheets. Was expecting ability to type conversational questions about data vs bluntly inputing object names. We are trying to provide an easy and intuitive self-service BI platform. We are still exploring the tools capabilities before releasing to wider audiences within organization. "I was an implementor of the ThoughtSPot appliance. " Ask many questions about how they support their product. Also sending data to the vendor they want to use a 3rd party called Egnyte. So you will be placing information to a third party. You may not like that idea. We were trying to solve a search engine issue for our in house clients. The application worked great in the Proof of Concept stage. When moving toward production we had many issues that needed to be addressed. Another main issue is ThoughtSPot wanted unfettered access to the appliance. Our company does not allow that. Also Thoughtspot wants to handle backups and restores of data, again something we do not allow. "ThoughtSpot for adhoc data analytics and visuals into your business"
ThoughSpot has excelled in a BI area called Search BI. Here a business user starts typing what he/she is looking for in a google-like search box with TS offering search completion hints. Once the business user has finalized and executed a search, TS automatically generates both the underlying data plan for retrieving the result data and the visuals to render the information in a way that is deemed most effective. And TS is very fast at doing this. It can take a little time to get used to this type of business analytics search capabilities. Initial setup time of course will be there (as expected with any BI product) when implementors have to spend time to learn about business data and what makes most sense of that data to decision-makers. We work as implementation partners with ThoughtSpot, helping them to find new clients, demonstrating the capabilities and driving towards sales and post-sales. I like how easy and quick it is to able to extract information from enriched fields within seconds to produce visualizations and answer questions...Manually, this process used to take hours to days. Having to learn the query language took time - there wasn't a real go-to section to write formulas. Thoughtspot allows you to use your time to understand what's happening with your business instead of running the processes to get to that point. Quantifying success with new products is easy to trend. We can more easily see the impact. The biggest benefit is the hundreds of hours our team saves every month. "Great Tool for the entire business to use"
The user interface is so easy to use and being able to create a pinboard in minutes for the rest of the business to use has made my life a lot easier! Ease of use, dashboard creation is simple and intuitive, support has always been available. Lack of row-level security, AWS users seem to be at a major disadvantage. Trying to show business analytics both internally to our BI team and externally to our clients. We are still unsure of it's use as we've only been encountering problems with TS on AWS. "Great Product, Excellent Support Staff." The group assigned to our implementation is highly customer service focused, very responsive and always helpful. They do a great job of detailing steps so all involved understand the process. At this point, there is nothing to dislike, critique or point out. We don't anticipate any issues. 100% recommendation to pursue purchasing ThoughtSpot. We are going to eliminate or virtually eliminate the need to continue to produce reports for our customers. The natural language approach will give them the ability to develop their own reports as needed. It will also reduce processing and hardware requirements within the reporting area. Fast answers done quicker than it takes to type in a query. As a power user I'd like a little more control and visibility into what the IT dept is stuffing into our system. Also so many people like this product and use this product that it gets full fast. Buy it you won't be sorry. Analytics. After a monthly 5 hour preassemble and load of our churn data we can do a weeks worth of analysis in less than an afternoon. Plus non-technical people can get answers by themselves. "Just implementing Thoughtspot. But so far so good!" Performance and ease of use. The tool to very easy to use once you understand how it works. The end user can naturally search and find the answers they are looking for. Importing the data. Automatically importing the data from other data sources into ThoughtSpot has to be done via scripts. For easy imports, I was hoping for a UI / wizard. We are implementing ThoughtSpot for the ease of use for AdHoc reporting. "A truly unique reporting solution"
"TS; So far So Good"
Ease of Use from the user perspective. My team will likely to use it more often. Currently in development of the product and have not run into dislikes yet. Try it. you can only gain knowledge and potentially solutions. Enabling team members to answer their own questions allowing me to work on the backend. * We monitor all ThoughtSpot reviews to prevent fraudulent reviews and keep review quality high. We do not post reviews by company employees or direct competitors. Validated reviews require the user to submit a screenshot of the product containing their user ID, in order to verify a user is an actual user of the product. Hi there! Are you looking to implement a solution like ThoughtSpot?